Apple pie is among those things I posted in the first months of blogging before I had many (any?) readers, so it has had few comments or Pins. So I'm bringing it out again, hoping it will now get the attention it deserves! Apple pie has always been one of my favorite desserts. My earliest food memory is of being in the kitchen watching my Southern grandmother make one when I was not yet three. I was fascinated that she could peel the apples in one continuous spiral, something I still cannot do. She served her apple pie with vanilla ice cream and a cup of coffee. Tea was the beverage of choice of my English grandmother, and her apple pies were more likely to have a side of custard sauce or whipped cream. But I don't recall ever seeing her follow that other (unappealing to me) English tradition of Cheshire or Cheddar cheese with apple pie. Peach pie is my number one favorite. But when peach season ends, that's it for me until next summer. Buying only in-season produce grown as close to home as possible gives us the pleasure of anticipation and supports local farmers. And both apples and peaches are on the Top 12 list of fruits and vegetables most important to buy organic because of having the highest levels of pesticide residue in the conventionally grown. And this illustrates why you should let the pie cool for three hours before cutting. 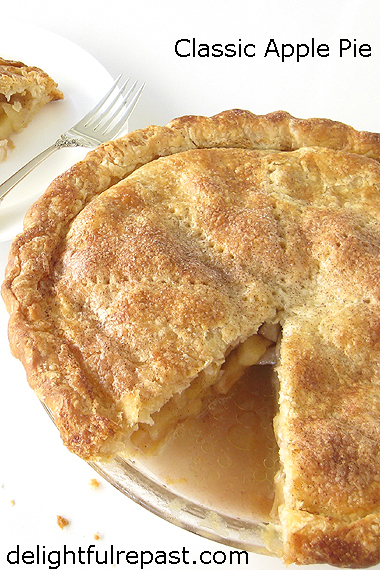 When you cut the pie too soon, the juices run out; cooling prevents this problem. I like to combine two apples with different qualities in a pie. A good combination of two that are readily available (in the US, anyway) is Granny Smith and Golden Delicious. But I made this one with all Braeburn. If you are fortunate enough to have an apple tree or live in an area where you can buy heritage apples, go for it. Look for varieties that are good "pie apples." I like Bramley and Cox's Orange Pippin, but haven't tried them in a pie yet. You might also want to check out my Rustic Apple Tart - Sour Cream Pastry. What are your favorite pie apples? And do you like the pie cooked until the apples are tender but still holding their shape, as I do, or until the apples are cooked down? * Check out the following pastry recipes: Pastry Tutorial - Food Processor or Pastry Tutorial - By Hand. If you're gluten-free, just double my Gluten-Free Pastry recipe and thicken the pie filling with tapioca flour rather than wheat flour. 1 Line a rimmed baking sheet with parchment or foil (I usually have a used piece of one or the other I'd like to get one more use out of). Spray a 9-inch glass pie plate with cooking spray and line with pastry; cover with parchment and place in the refrigerator. Roll out pastry for top crust on parchment; place on a baking sheet, cover with parchment and place in the refrigerator. 2 Peel and quarter apples, cut away cores and cut (the short way) 1/4-inch-thick slices into a large bowl (I use a 2-quart glass measure). Add lemon juice and toss gently. You can use all Granny Smiths, but I think the combination of the crisp, juicy, tart Granny Smith with the sweeter Golden Delicious adds a certain complexity to the pie and allows you to use less sugar. Note: Don't get carried away with the apples as some are wont to do. I even got a little carried away and used 7 cups, when 6 cups is exactly right for my standard 9-inch Pyrex pie plate, which is the perfect pie plate. 3 In small bowl, combine sugar, flour, spices and salt; add to apples and mix well. Pour into pastry-lined pie plate, dot with little pieces of butter and put top crust in place; seal and crimp edge; prick top with fork, marking eight wedges, to vent. Place on lined baking sheet to catch any drips from the pie. Pop the pie in the freezer for 15 minutes while preheating the oven. 4 Move your oven racks so that you can place your pie on the lowest. Preheat oven to 425F/220C/Gas7. Note: I don't always do it, but this time I brushed the top with a little cream and sprinkled on a bit of sugar mixed with cinnamon. 5 Bake for 20 minutes. Lower temperature to 350F/180C/Gas4 and bake for an additional 40 minutes, when the apples will be tender but still holding their shape. Cool on wire rack for 3 hours before serving; the pie needs that time to solidify so that all the juices don't run out when the pie is cut. Note: To warm individual slices of pie, preheat oven to 350F/180C/Gas4. Place on a rimmed baking sheet lined with parchment and bake for about 10 minutes. Hi Jean!I almost can smell your apple pie perfume!It looks DELIGHTFUL!Yes,,I'd love to have a slice of it,maybe two...I love a german kind of apple pie called Strudel,made with white raisins and puff(or flaky? )pastry,very delicious too.Hugs,my friend! Thank you, Maristella! Yes, I love strudel, too. It's been far too long since I've made it. Perhaps I'll post that someday. We have apple trees - I think they are Braeborns, but they were here before we were, so not totally sure. I spent an entire afternoon prepping apples for the freezer this year. Your recipe is pretty much what I make, and I like the apples cooked right down too. Cheese on pie? Could never get to like it. Custard or ice cream though, bring it on! Mrs Shoes, I'm so jealous - I haven't had an apple tree in decades. My mother and I used to make a day of freezing apples every year. Such fun! Yes, thank you, I’ll have a second helping, thank you, thank you. And did I mention thank you? Hold the tea. Hold the ice cream, the cheese (which some people like with apple pie), and the custard. With cream is good on anything, including more whip cream. 5 cleavers! Apple pie is so Autumn! This looks wonderful. Bet it smells great coming out of the oven, too! Sully, I'm so honored to be the recipient of the coveted 5-cleavers award! Thank you. I'm with you on the whipped cream! Jeanie, you're right - the smell of apple pie, well, it's almost the best part! Oh my gosh, Jean - yummmm!!! My parents are from Ireland and I love warm apple pie with custard....ok I'm going to pin this to make soon, I'm drooling now!! Debbie, that's wonderful! Thank you for telling me your family warm apple pie with custard story! Oh that pie crust looks so wonderful! I would love extra portion, Jean. Thank you, Angie. I do love pie crust! Apple pie is one of my all-time faves. I think, in general, I like the apples to still have some bite to them. And although I'm not the world's biggest custard fan, with apple pie, it's a perfect pairing. In fact, I'm off to check your recommendation for how to make that, too. Pauline, thank you. It is a perfect pairing. I made it for my brother years ago. He had forgotten our grandmother's, but he loved it. I hope you will too! Mildred, I love fried dried apple pies, but I've never had, or even heard of, an applesauce pie - I'm intrigued! Hmmm...I've never really thought of which pie apples I like best. I've enjoyed apple pie a la mode, but have never tried it with cheese. Looks as perfect as it should be. Yum! Thanks, Ellen! Wish I had some right now. Marisa, thank you. And "Guess what we picked?!" - too funny! I do know what you mean, though. But I don't want to give anything up, so it's all about small portions with me. Absolutely beautiful pie! I need to make an apple pie soon. I posted some of my best recipes when I first started blogging - with no readers. Did you delete the original post? I never know what to do with that and what Google does with that? Thank you, Lea Ann. No, I left the original there but changed the link on my Recipes index page to go to this one. I fund your recipe in a party and I can smell pie baking, it looks so yummy, makes my mouth water. Karren, thank you so much! Pins and shares and your kind invitation are much appreciated. Will do. Well, it looks like you got a few more comments this time around, Jean! 😉 I have been considering reviving some early recipes, too - I think I had zero comments on my first two posts! It's quite amazing how many variations there can be to something as simple as apple pie, and yet it is (they are?) classic. Ours our so different from one another and I promise you I will try yours to taste the difference! David, thank you. That would be wonderful to compare two different versions. As long as it has apples and not a horrendous amount of sugar, I'm sure to like it. Karen, you had an orchard?! That sounds wonderful. Hey, I'd strike up a conversation with some locals - I bet you could find one to whip up a pie! Love Apple Pie. Yes it is a classic for Fall and all year round. Thank you for the recipe, I will try yours too. I'm pinning it. Thank you, Fabby! And the Pin is much appreciated as well. Oh my Jean, I just had a cup of Chai Apple Spice tea. Wouldn't a slice of your pie be perfect with it? I like my apples very tender in my pie, as I don't like them crunchy and undercooked. The spices in yours sound perfect! Thanks for sharing another fabulous recipe!! Jean, your apple pie looks wonderful! Hubby's favourite will always be apple and he always got a home made apple pie for his birthday until recently. I usually use two kinds of apples, whatever is in season at that time of year. It has to be served with ice cream of course but I like it with cheese too. My Daddy always ate his with cheddar which is why I suppose I do. Have you never had a snack of apple slices and cheese? Same thing only better! I also prefer my apple pie heated up a bit. My physio therapist told me today that he will bake a home made, crust and all, apple pie for Thanksgiving dinner this weekend. I was so surprised because he is a young man of thirty-seven and I just figured his mother, wife, or grandmother would be making the pie. The young people are always surprising me! Have a lovely weekend, Jean! Kitty, thank you. You are so right - there's nothing more disappointing than being served a slice of apple pie only to find the apples are crunchy and undercooked! Thank you, Sandi. I'm with your husband - ice cream instead of cheese. Yes, I can enjoy cheese with a slice of raw apple and other raw fruits; but keep it off my pie! :D I'm impressed with your physiotherapist! It is October 7th and I have not yet made an apple pie this fall. I need to amend that situation. I have always used Granny Smith apples in my pies, but perhaps I should experiment? Yes, to the "tender but still holding their shape" kind of pie! Definitely with a cup of coffee! Cheryl, I've made many an apple pie with Granny Smiths, and they're good too. But I hope you'll try my half Granny half Golden Delicious sometime and let me know what you think of the combination. Enjoy your pie and coffee - a classic combination! Karen, thank you. I hope you'll try the crust soon. Let me know how you like it, or if you have any problems with it. I usually prefer nothing with it, "just pie," too! Thanks, Leanne. Yes, I love apple crumble, too. We have that a lot around here! What a lovely post, and your pie sounds delightful. Thank you, Adri. 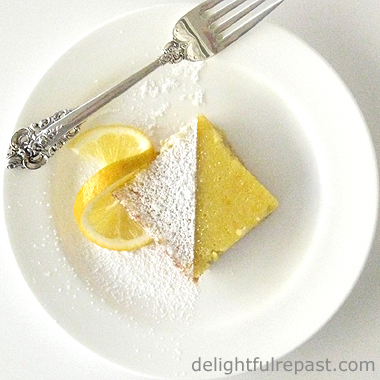 It would be delightful to have a slice right now! Nicola, thank you! Let me know how it turns out for you. 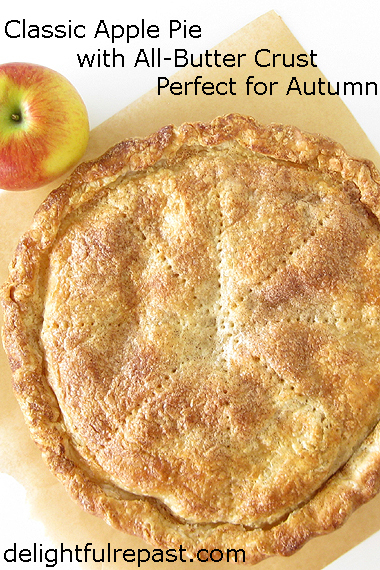 Your Classic Apple Pie looks amazing! Hope you have a great weekend and thanks so much for sharing your post with us at Full Plate Thursday! Thank you, Miz Helen. And I hope you're having a great weekend, too! Oh how gorgeous, Jean! I do love apple pie. My favorite is rhubarb and next year my plant should produce some yummy pie. I think you've inspired me to make an apple pie. Thanks, Pom Pom! I hope to make some rhubarb pies next year, too (though not homegrown rhubarb), but in the meantime I'm loving these apple pies. Roseann, thank you! Fruit pies are my favorites, especially apple, blackberry and peach. 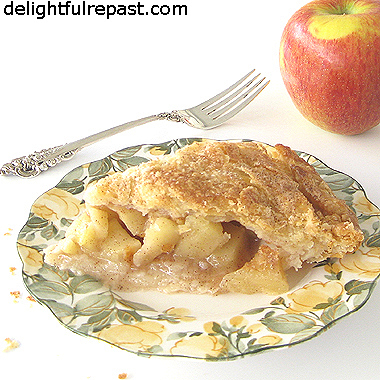 Jane Austen was right, apple pies means such a joy to me since I was a little girl ! I've been missing you and your wonderful blog posts so much, cherished friend ! Dany dear, thank you. I've missed you too. Can't wait to get some projects behind me so I can get back into my usual routine! Hugs. Thanks, Jay, I'll do that! It definitely fits the "Smell Good" category - it smells amazing! Oh this Apple pie looks wonderful. There are so many festivals right now and many sell apples so this is perfect for this time of year. Thank you for sharing Jean and sorry I am just getting here late to comment - life has been extra busy! Oh Bernideen, thank you so much. I know how it is when life gets extra busy! Pinned it on my pie board. Pecan is my favorite autumn pie. Gotta have Blue Bell Vanilla ice cream on each of them. Thank you, Laura! I love pecan, too, especially my own made without corn syrup. Can't wait to check out your pie board! Perfect recipe for this time of the year! Who doesn't like apple pie? One of my favorites -- never tire of it. Yours looks excellent -- thanks. Thanks, KR! And what autumnal bevvie would you recommend for it? Lovely, Jean. I'm a lover of cheddar cheese cooked in the apple pie! I love sliced apples with cheddar cheese for a treat! Thanks for the reminder of the pesticides in the apples. I will get organic for my Delightful Repast Apple Pie! My favorite pie is apricot followed by peach then apple. Sue, that's a new one on me - cooking the cheese IN the pie! And I forgot about apricot pie - next summer I'll be all over it! Glad you're going to get organic apples. Apple pie just says "Autumn" to me. Your apple pie looks amazing, Jean. There are so many apple goodies at this time of year to enjoy. I wish I had a piece of your Yummy apple pie to go with my coffee right now. It looks wonderful. Thank you, Sheri. I wish I did, too! Jean there is nothing that screams "it is the end of summer and thank goodness for that because fall is here" than apple pie. I will definitely be trying out your recipe. I love a good apple pie too, Jean. I remember peeling apples with my Grandpa for pie - we used to try to get the skin off in a continuous spiral too. Apparently if you did, you could throw the peel on the floor and it would form the shape of the letter that was ti be the first letter of the name of the person you would marry! Your pie looks delicious, and I'm so glad you shared the recipe with us at the Hearth and Soul Link party. Pinning and sharing! Mary, thank you so much! Do let me know how it turns out for you. April, thank you. And thank you for sharing your sweet apple pie/Grandpa story!